This gas pump image was taken at a gas station in Shelburn, Indiana on September 11, 2001. On that eventful day I waited in a long line to get this precious fuel so I could get home after a bizarre day of speaking about green architecture at a conference where the shocked attendees all had other things on their minds. I took the photo because it occurred to me that gas prices that high would change everything. Now that gas is back up to within $1.40 of that day's price, it is time to revisit that day's epiphany and explore why gas prices are so high now and where they may be going in the short term and the long term. How does the cost of oil impact other aspects of our lives? Finally, what are some potential strategies and solutions as we strive to go from brown to green, that is from the existing unsustainable situation to a preferred sustainable state? A year ago, crude oil was selling for $66 per barrel (42 gallons per barrel). This week, it breezed past double that amount and regular gas prices rose above $4 per gallon at gas pumps around Indianapolis. According to the federal government, about 70% of the cost at the pump is directly related to the cost of crude oil. 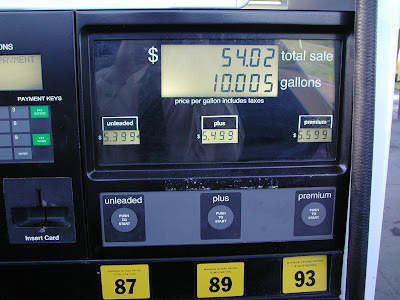 Crude oil prices are set by market forces, primarily by supply and demand, but also by more complex influences, such as the value of the dollar, instability in oil-producing states and also by less scientific factors such as market psychology, fear and rumor (the latter three provided the cost at the pump illustrated in Shelburn in 2001). Demand for oil illustrates the degree to which the global economy and especially the U.S. economy is addicted to this non-renewable fossil fuel. According to IEEE Spectrum, annual consumption of oil world-wide is just over a cubic mile of oil. 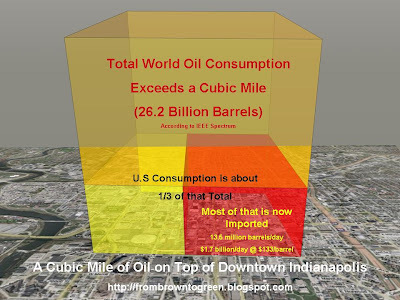 The illustration at left gives you an idea of the volume of a cubic mile of oil by plopping down a 5,280-foot-tall tank on top of the famous square mile that is Downtown Indiapolis between North, South, East and West streets (that's six times the height of the 49-floor Chase Tower). Another way to picture that amount is to imagine a gallon of oil on every square foot of Indiana's 39,000 square miles. As the graphic illustrates, Americans make up only about 5% of the world population but consume almost a third of the world's crude oil, the majority of which is now imported. Oil production in the United States, once the world's largest producer, peaked in 1970 and we are currently importing at the rate of 13.6 million barrels a day, thereby exporting $1.7 billion dollars a day at $133/barrel. The top ten countries we import oil from are: Canada, Saudi Arabia, Mexico, Venezuela, Nigeria, Iraq, Angola, Ecuador, Algeria and Brazil. Looking at that list, you may get a feel for the idea of energy security. By wasting energy, we are enriching other nations, including some that may not be counted as particularly friendly or stable. We are currently spending $200 million a day to try to stabilize Iraq, for example. According to a Newsweek article, the weight of U.S. vehicles has increased by nearly a thousand pounds in the past 20 years and the average horsepower has climbed from 118 to 223. In the same time period, the average miles driven per household has jumped 42 percent, from 19,000 miles to 27,000 miles last year. The nationwide average drive time to work is 24.3 minutes or 100 hours per year, the equivalent to 2.5 weeks of vacation time, according to the U.S. Census Bureau. The average gas mileage of "consumer road vehicles" in the U.S. is 17 miles per gallon, but there are over 50 models of automobiles that get more than twice that fuel efficiency and some get three times as much productivity per gallon of gas. Each American uses the equivalent energy of 10 Chinese or 33 Indians, but that ratio is changing dramatically as those two most populous countries, over 3 billion people, get better at emulating our gas-fueled lifestyle. While U.S. oil consumption grew by 2.8% in 2004, demand in China grew by a staggering 15.8% and in India by 5.5%. Some experts believe part of the recent price surge has to do with China sucking up world diesel supplies to supplement their coal shortage and generate electricity for the provinces affected by the recent earthquake. I urge you to read The Elephant and the Dragon: The Rise of India and China and What if Means for All of Us, by Robin Meredith to learn how the largest economy in the world, the United States, and the fourth largest economy in the world, China, will reach parity by 2015. Another must read is the June issue of Fast Company's Special Report by Richard Behar, China in Africa about how China is scrambling to lock up energy supplies and natural resources. The other elephant in the room that is causing rising demand is population growth. World population will grow to 8 to 12 billion by the end of this century while the resources needed to sustain that growth, such as fertile soil, fisheries, fertilizer, oil, water and raw materials are leveling off or declining. As current emerging nations and their swelling populations clamor for a western lifestyle, including our diet and our cars, crude oil demand may dramatically increase, even as supply begins to peak and then decline. Typically, gas prices subside after the Memorial Day weekend, and that may happen this summer as well, but many analysts are predicting a continuing surge in liquid fuel prices. Analysts at Goldman Sachs have predicted crude oil prices will average $141 per barrel in the second half of the year. Earlier in May, a group of Goldman Sachs oil analysts raised the possibility of a "super-spike" in crude oil to $200 in the next year. Crude at $200/barrel would lead to gas at the pump in the $6 to $6.50 per gallon range. Because of our devalued dollar we are paying more for oil, which further increases our trade deficit, which further devalues our dollar. Cars aren't the only things affected by the end of Cheap Oil. American Airlines, due to a 50% increase in jet fuel costs over the past year, plans to charge for baggage. Airline stocks are plummeting, flights and employees are being trimmed as jet fuel prices soar. Petroleum is used in the manufacture of thousands of products including plastics, fertilizers, fibers and asphalt. Products are shipped on planes, ships, river barges, trains and trucks using petroleum. Our globalized economy relies on cheap fuel to make it possible for us to purchase Fiji water or Fiji apples from the other side of the globe at a cost that makes local products manufactured with local labor non-competitive. Cheap fuel has made possible the suburbanization of America, the export of manufacturing jobs to China, and the success of transportation-dependent enterprises like Wal-Mart. High fuel costs create inflation pressure across the entire spectrum. Diesel costs have risen faster than gas costs which has a huge impact on the trucking and construction industries that rely on diesel-powered vehicles. Reed Construction Data reported that asphalt costs are up by 13% from the first of the year and that steel suppliers "have been burning up the fax wires announcing huge price increases and canceling previous quotes." Any commodity that is made with high fuel energy inputs, such as steel, or has high petroleum content, such as asphalt and plastic, are seeing increased costs that will be passed along to consumers. Petroleum costs dramatically effect food costs by impacting the cost of producing, fertilizing, processing and shipping the world's food supply. Recent food riots in Niger, Burkina Faso, Guinea, Yemen and Mexico point to the vulnerability felt more intensely by the poor of the world, who pay a larger part of their income for food and fuel. At some point, all this inflation in prices will slow the global economy to the point where demand will be decreased and prices will fall, at least that has been the typical pattern. There's growing evidence, however, for another more fundamental pattern that will have much more significant impact long term. Just as oil production in the United States peaked in 1970, world oil production will likely peak and begin to decline at some point in the near future (if it hasn't already). Oil is a finite fossil resource, not a limitless resource. If you haven't yet heard of Peak Oil, it is worth your time to investigate this coming phenomenon. As world oil supply peaks and begins to decline, it is likely to have a dramatic impact on your daily life. A quick primer on Peak Oil is available at the Indiana Energy Conference Web Page. Another quick reference is provided by the City of Bloomington, Indiana Peak Oil Task Force or the Portland, Oregon Peak Oil Task Force. For a lengthier take on peak oil, consider this Peak Oil book list and the blog: The Oil Drum. Consider how your life would be different if gas climbed above $6 per gallon in the next year and then just stayed there or kept climbing. How would you respond? How would that effect your job, your commute, your budget, and your lifestyle? As I stood there at the pump in Shelburn in 2001, I had the epiphany that everything had changed. In reality, it hadn't, but it may have been a premonition. How would you respond to that degree of change, especially if it was permanent? When the cubic mile of oil begins to decline and demand continues to grow, we will all be faced with some difficult decisions. No current technology exists to replace the energy density in all that oil in the amounts we are currently consuming, as the IEEE Spectrum article points out with a number of comparisons. Denial - this is most common response to dramatic change, exemplified in this instance by politicians who offer to cut fuel taxes or divert contributions to the Strategic Petroleum Reserve, two actions that work against a long-term solution and would have very little impact in the short term. Anger - this is another common response, equally unproductive, exemplified by tirades against the oil companies or gas station owners, when the real solution rests with the person you see in the mirror in the morning. Conservation - this is perhaps the most proactive, least expensive, most productive and most profitable response. This is one response that will generate new jobs and new industries that thrive on new clean energy technology. This is also the easiest one to pull off in most cases. Carpooling, taking the bus, walking, biking, eliminating unnecessary trips or buying more fuel efficient vehicles all fall into this category. Moving closer to work or locating in a well-designed smart development are other ways to participate in this response. If everyone drove a vehicle that got 34 miles per gallon, we wouldn't be importing oil. Alternative Fuels - this is one of those clean tech opportunities that will lift the tide of investment in fuels like cellulosic ethanol and biodiesel from algae grown with municipal sewage and other alternative fuels under development. The problem with this scenario it that we are nowhere near producing enough alternative fuel to make a serious dent in the cubic mile of oil and ramping up new technology often takes 20 years or more. We need to get serious about alternative fuels by shifting at least some of the current subsidies from oil companies to alternative energy research and development. 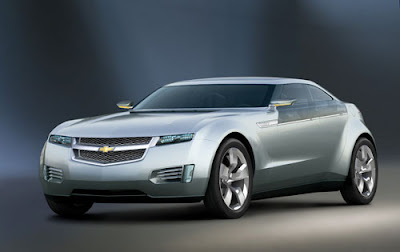 Advanced Fuel-efficient Vehicles - lightweight, aerodynamic, hybrid and plug-in electric vehicles can offer part of the solution. Introduction of several plug-in hybrid electric vehicles (PHEVs) in 2010 from major manufacturers, including Toyota, General Motors (Chevy Volt pictured) and Ford promises to change the landscape and offers the opportunity for the "smart garage" concept to take hold which provides potential synergy with wind and solar power to interface with the electrical grid in an intelligent manner that makes all three technologies more viable. The batteries in plug-in hybrids, for example, can be used to store power generated by wind turbines to help level peak loads on the grid. Conventional hybrid cars passed 3% market share in March and Toyota sold it's millionth Prius. Mass transit - many communities don't offer a viable alternative to personal transportation because they were designed during the automobile-centric suburban sprawl age and mass transit just isn't feasible any time soon. In Indianapolis, plans are afoot to start commuter rail service from the Northeast quadrant to Downtown using vintage trains at a fraction of the cost for an all-new system. A massive shift in emphasis is needed away from funding highways toward funding mass transit and transit oriented development (TOD) to provide the density necessary to make mass transit viable. Localization - globalization depends on cheap fuel to transport the goods manufactured in China to be sold in the United States, for example. As fuel costs and transportation costs climb, a greater emphasis on local and regional trade will become more common, as will a return to local labor and local manufacturing. This is particularly apparent in the growing Local Foods (consumed by locovores) and Slow Foods movements. Smart Development - walkable neighborhoods and cities are coming back where cars are optional but sidewalks are mandatory. Property values are beginning to increase closer to urban cores and decrease in proportion to commuting distance to the core. A good introduction to this topic can be gleaned from, Surburban Nation: The Rise of Sprawl and the Decline of the American Dream, by Andres Duany, Elizabeth Plater-Zyberk, and Jeff Speck. Another, more current read on the topic from the Urban Land Institute is Growing Cooler: The Evidence on Urban Development and Climate Change, which documents how key changes in land development patterns could help reduce vehicle use and greenhouse emissions. Sustainable Agriculture - modern agribusiness is petroleum intensive including the fuel consumed manufacturing and transporting the high-horsepower tractors, to keep them running, to make the fertilizer and spread it, to plow the fields and plant the crops, to keep them cultivated and irrigated, to harvest the crops, dry the grain and transport it to market. Sustainable agriculture attempts to mimic more diverse natural systems and reduce the need for intervention with power equipment. Green Buildings - While buildings may not be considered to be gas guzzlers, they are among the worst offenders in terms of wasting energy and resources and offer a large part of the solution. Green buildings use materials and energy more wisely and are less dependent on fossil fuels. Buildings can be designed today to use a third less energy without increasing the initial cost. Off-the-shelf technology is available to design buildings that make as much energy as they use, including the energy required to make their components, ship them to the site and erect the buildings. LEED Platinum buildings, net-zero-energy buildings and Living Buildings are relatively rare now, but they point the way to standard building design of the 21st Century. Please stay tuned to this blog as we take a closer look at each of these areas and drill down into the details to move from brown to green. Your comments and ideas for future posts are appreciated. Absolutely great post. I will try to feature it in my blog in the next few days. Change the World in 888 days.